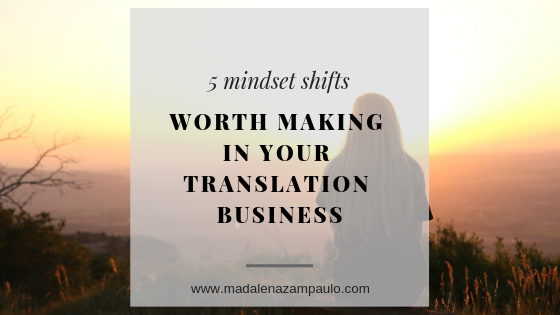 I talk to a lot of translators and interpreters in our industry. They are amazing colleagues, and the diversity is always so inspiring for me. But one thing we all tend to have in common is that we make excuses when it comes to the things we want to keep putting off in our businesses. What can we say? We're human! But why do we do this? I recently heard this explanation: our brains are wired to avoid the things that feel uncomfortable and to keep on doing what is most comfortable, even if it means we don't grow or improve in the process. But at what point does staying in our comfort zone result in stagnation? I had this discussion with a few translator friends recently, and the conclusion seems to be the same. Going outside of our comfort zone is totally worth it. The outcomes are often better than we expected, and once we've reached the other side, we realize that it wasn't actually all that hard. Most of the difficulty was created from the excuses we made! These excuses we make for ourselves are not serving us in any way. In reality, we usually just need to make a mindset shift in order to stop making these excuses. We can easily switch these excuses to action items that are less painful by making them a habit--something we do daily or weekly. Here are five excuses I often hear from colleagues and my suggestions on mindset shifts that result in action items to help move the needle forward in our businesses. 1. Excuse: I'll start __________ (marketing, updating my website, etc.) when I'm less busy with client projects. Action Item: I'll work on __________ (marketing, updating my website, etc.) one morning a week so that I can make progress in this area while still serving my clients and building revenue in my business. 2. Excuse: I'll sign up for that ___________ (webinar, course, conference, etc.) when I am making more money. Action Item: I'll invest in my professional development now and work hard to pay for this ___________ (webinar, course, conference, etc. ), because I know that it will allow me to sharpen my skills, make more money, etc. 3. Excuse: Even though I would prefer better clients, I don't have time to market my business, because I am so busy with the ones I have. Action Item: I will spend 20 minutes a day marketing my business so that I can slowly replace the difficult-to-work-with or low-paying clients with better ones this year. 4. Excuse: There don't seem to be any direct clients in my area(s) of specialization. All of them prefer to work with large language services companies. So, I'll probably just work for agencies for the rest of my career, unless I change or add a specialization to my service offerings. Action Item: I'll will brainstorm or talk to a colleague for 15 minutes a week to come up with some ideas of direct clients to whom I could market my translation services. And I will consider developing a second area of specialization that would allow me to market my services to more direct clients. Action Item: I will look at my email three times a day (once in the morning, once before lunch and once at the end of the day before I wrap things up for the evening). I will respond to all client requests at that time, and I will let my clients know what times I'll be in my inbox so that they know when to expect my replies. I will also look for more clients who respect these boundaries and do not expect me to always be available to them. It's easy to make these and other excuses. I'm guilty of making excuses myself. We all do it in some area of our lives and businesses! It's human nature to take the more comfortable route if given the option. But we will only grow or improve when we decide to take that stroll outside our comfort zone. What kind of excuses do you make in your business? What mindset shifts can you make to help you overcome the excuses and start taking action?